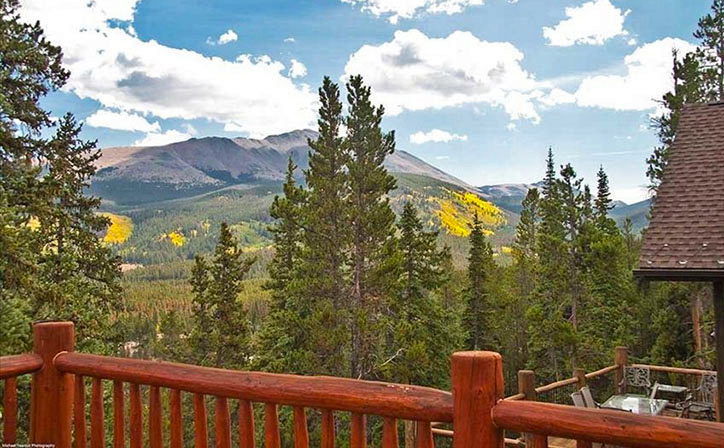 Breck Splendor Breckenridge Colorado Luxury Vacation Home lives up to its name both with its incredible views of Mt. Baldy and its luxurious interior furnishings. 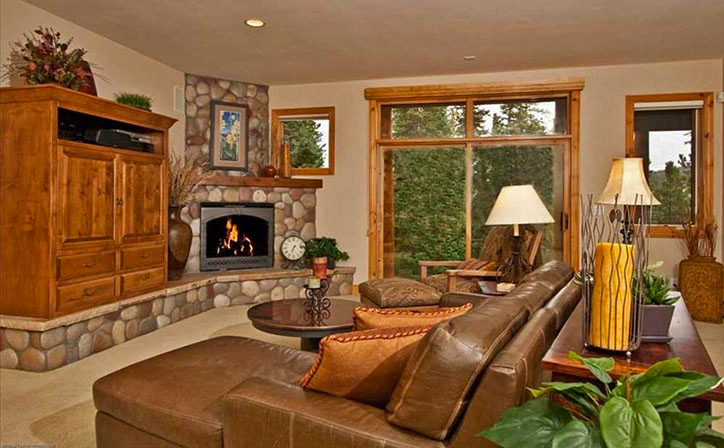 This house features two large family rooms with beautiful rock fireplaces on each level. The lower level also has an open wet bar and a Bose surround sound stereo system. The master bedroom features a California sleep comfort king size bed, a private balcony with a spectacular view of Mt. 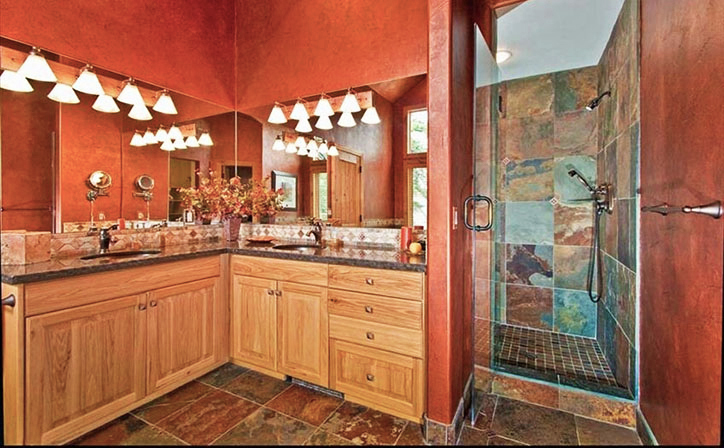 Baldy, and a large stunning master bathroom with copper inlaid tile, Jacuzzi jetted tub and a separate shower. 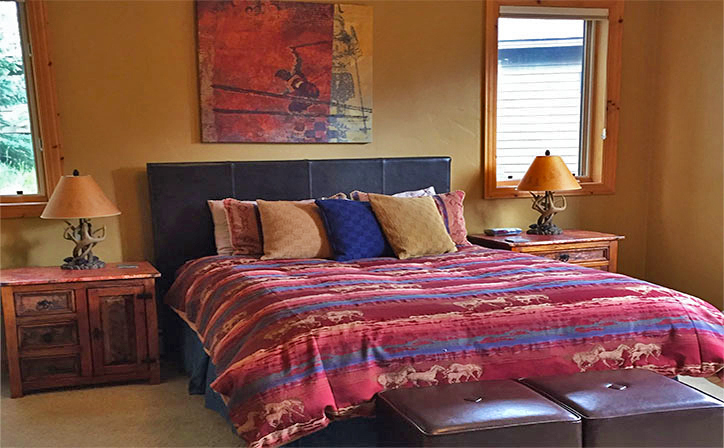 Breck Splendor Breckenridge Colorado Luxury Vacation Home is located in Warriors Mark, an exclusive, friendly neighborhood right next to the Peak National Forest. It is just a short distance to put on your skis and ski to the Beaver Run Chair Lift on Peak 9. 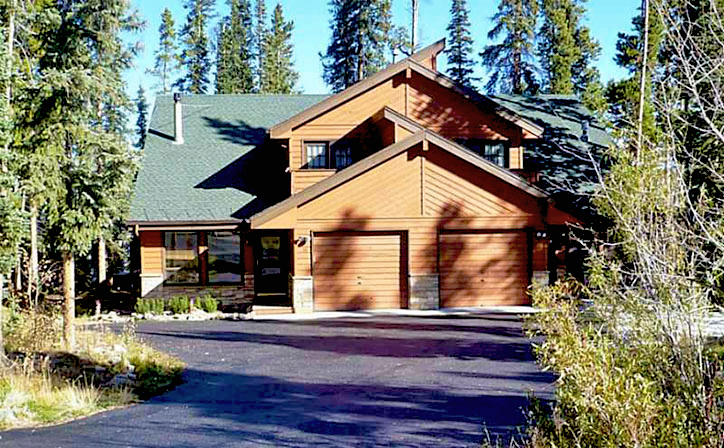 Breck Splendor Breckenridge Colorado Luxury Vacation Home is located in an exclusive, friendly neighborhood right next to the Peak National Forest. It is a short 75-yard walk to put on your skies and ski to the Beaver Run Chair Lift on Peak 9. You will ski out on Peak 9 and can come back on either Peak 9 or 10 based on your ski level. Green skiers can do Peak 9. 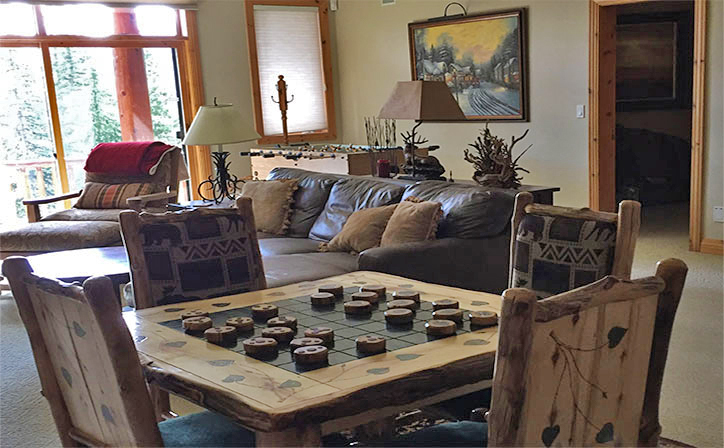 Enjoy your Rocky Mountain vacation in this beautiful Breck Splendor Breckenridge Colorado Luxury Vacation Home, that can comfortably sleep 17. 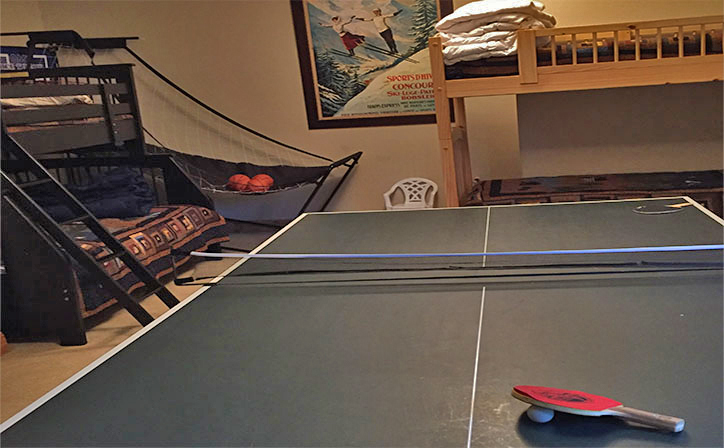 At Breck Splendor Breckenridge Colorado Luxury Vacation Home, there are plenty of warmly decorated rooms to accommodate your group during day and night. 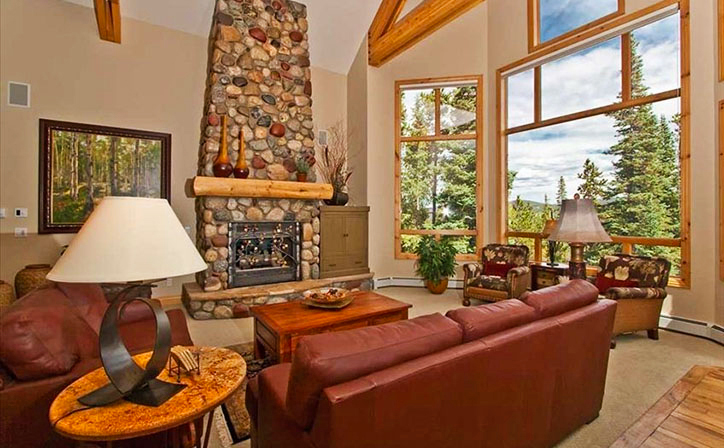 The gorgeous great room with a large rock gas fireplace, and access to the hot tub, can easily seat 10/12. There is also a separate living room for additional adults or kids. 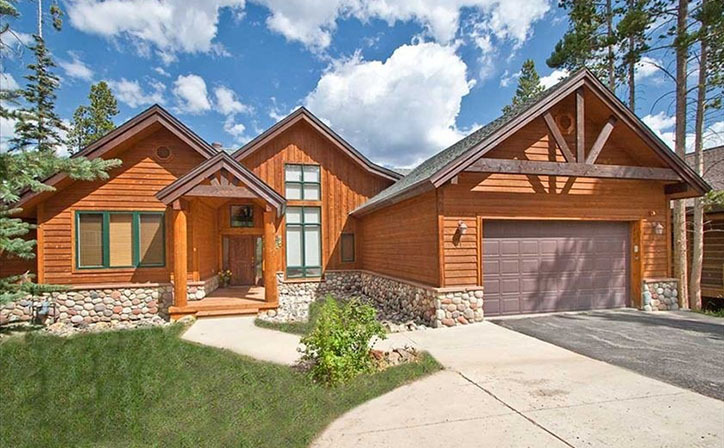 This warm, open design with over 20-foot ceilings makes it perfect for large families. The gourmet kitchen with hardwood floors and granite counter tops is fully stocked to meet all of your cooking needs. The Dining area will easily seat 10 and the eat in Kitchen has a table for six, and a large kitchen bar that seats 4, which is the perfect place to relax and rejuvenate after your day of skiing or hiking at Breck Splendor Breckenridge Colorado Luxury Vacation Home. A day of activity in the mountains is never complete without a dip in a hot tub. 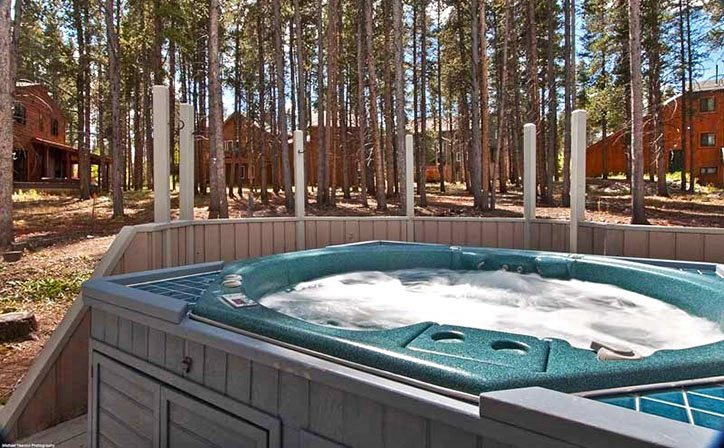 At Breck Splendor Breckenridge Colorado Luxury Vacation Home, you can enjoy our large, new hot tub surrounded by Lodge Pole pine trees on one of the two outside decks. While relaxing, you have beautiful views of Mount Baldy and the snow covered mountains. 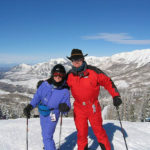 Breck Splendor Breckenridge Colorado Luxury Vacation Home will be perfect for your next Ski or Rocky Mountain Vacation. We hope you enjoy our home as much as we do! 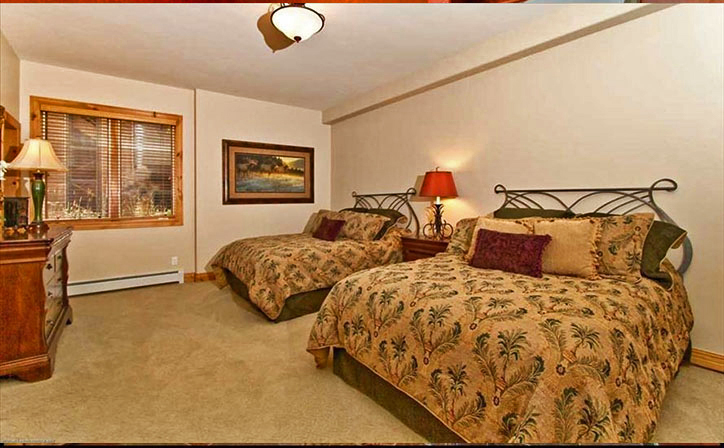 What Breck Splendor Breckenridge Colorado Luxury Vacation Home offers! No Pets Allowed, No Smoking, Minimum Age 25 (For Renter), Children Welcome (Pac n Play, High Chair & Booster Seat included), Limited Accessibility for Large Wheel Chairs. 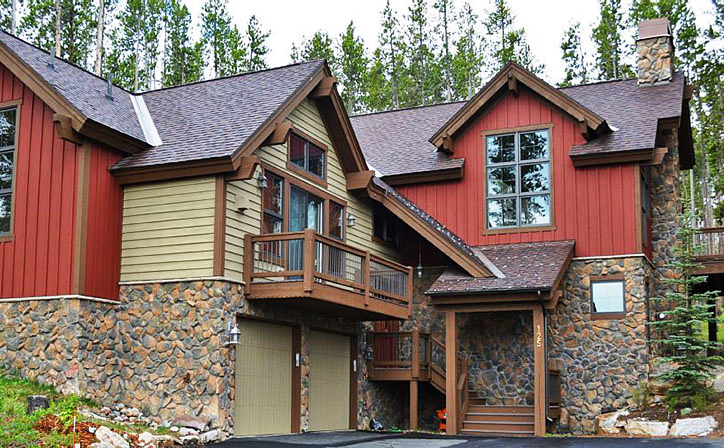 We would highly recommend Breck Splendor. I cannot say enough good things about the wonderful time we had at Breck Splendor and skiing in Breckenridge. We were there as a family to celebrate our twins 30th birthday. Bill was very easy to work with from the beginning and always quick to answer any questions we had in the beginning and throughout the trip. Bill also provided loads of information that was very helpful. The house is so spacious, well stocked and was beyond our expectations. The hot tub was so invited after a day of skiing. Having the access to the shuttle just down the road was a big plus, and we used it a lot. It was just a short walk to be able to ski in and ski out, which we definitely took advantage of. Skiing out was great for almost all levels, but we left the skiing in to the little bit better skiers in our group. 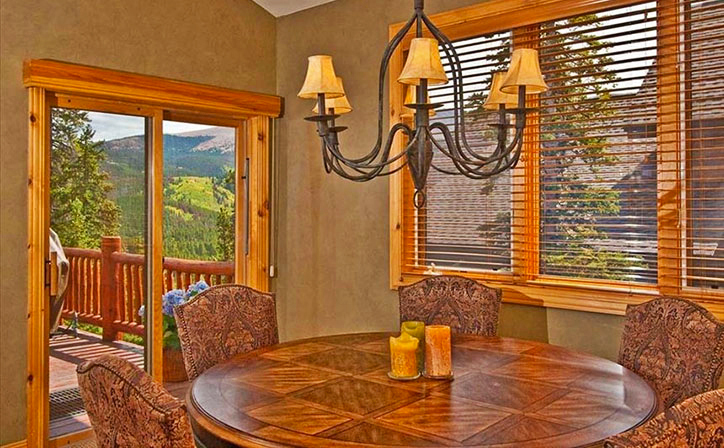 We would highly recommend Breck Splendor. Working with Bill was an absolute pleasure, not only was he easy to connect with but he was very responsive and his details for our trip helped us a ton! The house was more beautiful then we expected. The pictures don't do it justice. The views were amazing and the location was very easy. The house was fully equipped and there was no spare on expensive of comfort items. We had 4 families with 15 adults and kids and there was plenty of room for all of us. We cant wait to visit Breck again and the possibility of staying in Breck Splendor. Thank you again Bill! First let me preface this review by saying Mr. Bill Hadley is the best property manager I have ever encountered. The website does not do this home justice, it sits above Breckenridge with spectacular views from every deck, the house is gorgeous, decorated with beautiful furniture, wall coverings and paintings, not to mention the kitchen that I found to be a cooks dream, from the gas stove to the well stocked cabinets with everything you need and spacious seating in the kitchen and dining room. The hot tub was plenty roomy for 9 women to enjoy a cool evening after a day of shopping. The house is close to town, (some of us walked) yet far enough to enjoy the wildlife that cautiously wander about, ie: raccoons and beautiful red fox and the sounds of birds singing. 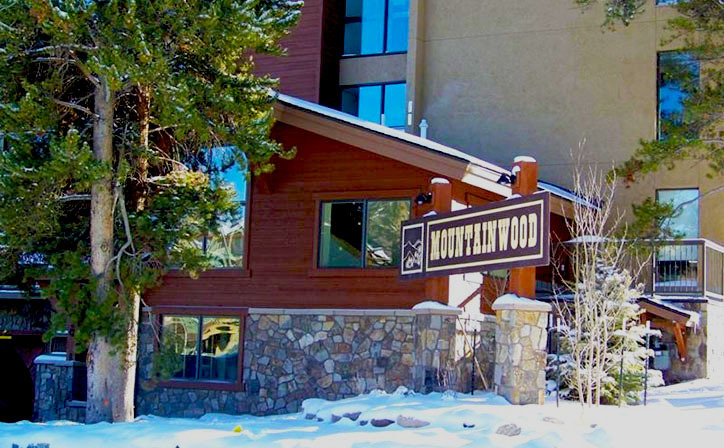 Whether you're looking for a "home" to relax, ski, shop or gather with friends and family this is the place! After 3 days we were all convinced we would return to Breck Splendor in a heartbeat. Thank you Bill for all your help and wonderful restaurant suggestions. We highly recommend this beautiful, spacious and well-cared for home! We highly recommend this beautiful, spacious and well-cared for home! We had 13 adults and children in our group, and we never felt crowded. 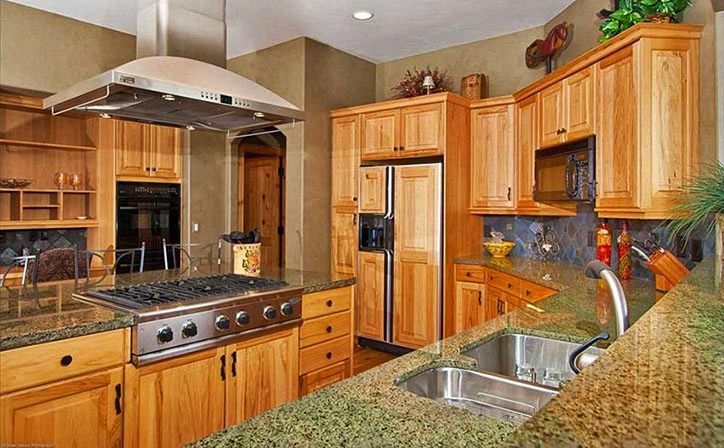 It has a well-stocked kitchen, and wonderful eating & gathering spaces, views of the mountains, deck, and hot tub. I really appreciated the second full sized refrigerator in the garage for beverages. Great location too - close to town, but a quick escape from it! Best of all, we got to meet the neighborhood fox! Beautiful creature. This house was amazing! Accommodated our large family. Kitchen was well stocked. Every bedroom has it own bathroom for privacy. Game room was great for the kids with us (ages 5, 7 & 12). Great location, only 5 minutes to town. Great views of the mountains! I can't say enough good things about this house......exceeded our expectations! We stayed at this great house for 5 nights over our spring break this year. We were a large mixed group. Two younger kids and a slew of teenagers, plus the adults that go along with them. Besides being a beautiful home with a fabulous view, this house is set up as a "home" not a rental. We had a call from the owner minutes after walking in to tell us about a few of the features that we may not have discovered right away - like the awesome sound system. The kitchen is layed out great and there are plenty of seats for dining. The round table in the breakfast area is especially helpful to add another chair or two. The dining room table is very close in proximity to the kitchen so with large groups you still feel like you are together. The hot tub is wonderful and not too far from the door, a basket of extra towels was even provided. The downstairs level was great for the kids to hang out. 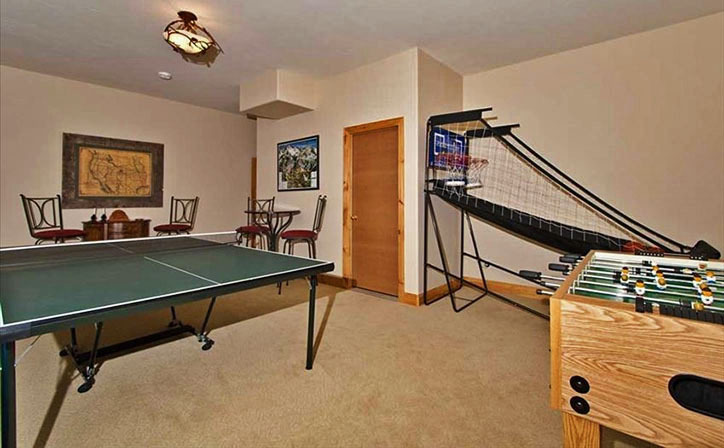 TV, Foosball, game room, board games - we only saw the kids when they were hungry. Beds were very comfy all around. Ski out was pretty easy, Ski in was exhilarating. Some in this group have been meeting in Breck for 12 years. I had a conversation with one of the older "kids" about the house. He said it was one of the first houses that seemed like a home. Quite an observation from a 21 year old. The others in the group said this was the best house we have ever had. It could be the very first house that we rent again. Great place! What a fantastic house and location! What a fantastic house and location! We had a group of 4 adults and 4 children, there was plenty of room for everyone with plenty of privacy as well. The house is very clean and comfortable. The location is great, just minutes to town! Skiing in and out was also a breeze. Bill was great to work with and was able to organize our stay on really short notice. Thank you for a wonderful getaway! The vandermeulen's- Colorado Springs.